Most commercial vegetable oils contain at least some linoleic acid or alpha-linolenic acid, the only two fatty acids that are considered essential to human health, and hemp seed is a particularly rich source of both (Deferne and Pate 1996). The double bonds within each molecule are naturally produced in the cis- (pronounced ‘sis’) conformation. 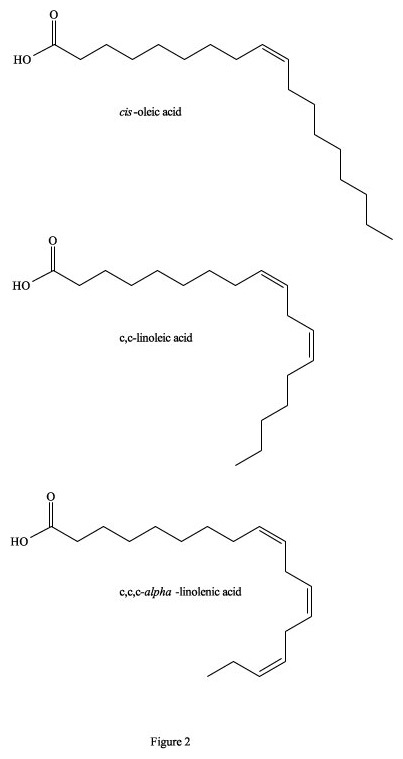 Linoleic acid has two of these double bonds and alpha-linolenic has three. 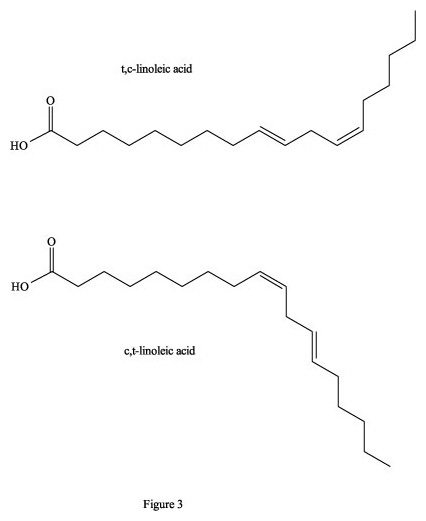 In order to describe the structural relationship of possible double bond combinations, the two cis- double bonds in native linoleic acid are denoted as ‘c,c’, the three bonds in native alpha-linolenic acid as ‘c,c,c’, and trans- bonds in either are designated as ‘t’. Heating will alter these molecular geometries, and various combinations of cis- and trans- double bonds are the result. A considerable body of literature exists on defining the times and temperatures for these trans-formations (no pun intended). With a native c,c,c-alpha-linolenic acid, for example, the c,c,t isomer forms faster than the t,c,c, followed by t,c,t, then c,t,c (Wolff 1993). In fact, the c,c,t and t,c,c isomers seem to form immediately at 245°C, and continue in a linear fashion for approximately 8 hours, with slopes exceeding unity. The curves for these two isomers then begin to level out, at which point the production of t,c,t begins to pick up, indicating that more energy is required to twist the additional cis- double bonds into their trans- con-figurations. Only after 16 hours of heating at 245°C does the t,t,t isomer (measured in Dr. Mölleken’s work) begin to appear, and at less than 0.5% of the total fatty acids. The results of Wolff are in line with earlier studies on highly unsaturated vegetable oils (e.g. Grandgirard et al. 1984), and there is no apparent reason to assume that hemp seed oil will behave differently. Figure 1. Trans- isomers of fatty acids. It has been estimated that between 25,000 to 30,000 deaths per year in the US alone are directly attributable to excessive trans-fatty acids in the diet (Koletzko and Decsi 1997). This is primarily due to a build-up of fatty deposits on the inside of blood vessels that eventually restrict blood flow, because totally trans-fatty acids have a linear zig-zag geometry that encourages the molecules to pack closely together to form semi-solids, even at 37°C (Figure 1). They are also incorporated as building material into cellular membranes, resulting in their rigidity and restricted permeability. In contrast, cis-isomers of fatty acids tend towards a curved shape, depending on the number of double bonds, and solidification temperatures are often well below 0°C (Figure 2). 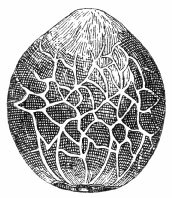 Their incorporation into cell membranes increases fluidity, which facilitates cellular functions. To visualize this phenomenon, imagine a collection of bar magnets stacked together as analogous to the trans-fatty acids, while the cis-isomers are more like horseshoe magnets, which do not stack together very well. On both the molecular and macroscopic levels, these properties are due to natural electro-magnetic forces of attraction and repulsion; the eternal yin-yang of positive and negative (Wirtschafter 1997). Figure 2. Cis- isomers of fatty acids. If a person were physically very active, and burned a lot of calories, then the consumption of saturated fats and perhaps even trans-fatty acids from non-essential fatty acids might not be a serious health risk. Dr. Mölleken rightly points out that trans-fatty acids are found in the seeds and leaves of some plants, but one wonders how often these plants are used by humans as foods. It was also mentioned that trans-fatty acids are found in marsupials and ruminants, but one also wonders about the quality of food being fed to the latter animals. Could it be that the trans- fatty acids carnivorous humans acquire via animal products are actually a consequence of the animal’s diet; i.e., a diet of industrial by-products that are not fit for direct human consumption? It should also be noted that additional and un-healthy chemical reactions (e.g., oxidations to peroxides, free radical formations, etc.) can occur at temperatures well below those required for trans-fatty acid formation. Figure 3. Cis-, trans- isomers of linoleic acid. A more insidious problem that occurs from heating highly un-saturated vegetable oils that contain essential fatty acids (EFAs) is that any alteration in their molecular geometry will result in products that block the enzyme delta-6-desaturase. This enzymatic reaction is the important first step that the body takes to convert EFAs to vital metabolic products such as gamma-linolenic acid (GLA, derived from linoleic acid), stearidonic acid (SDA, from alpha-linolenic acid), which are then made into prostaglandins, leukotrienes and eicosanoids. For example, if only one of the two double bonds in linoleic acid is converted to trans- after heating, then this c,t- (or t,c) product of the native c,c-linoleic acid will block this critical metabolic pathway (Figure 3). Metabolic deficiencies in EFAs, either through an insufficient diet or an excessive consumption of trans-EFAs, have been linked to a variety of chronic and degenerative diseases (Horrobin 1990, Yehuda and Mostofsky 1997). Presently, too little is known to say much about the kinetics of this enzymatic reaction, and it would be premature to speculate at what levels trans-EFAs might be tolerable in an otherwise optimal diet. Although the conclusions of Dr. Mölleken seem questionable, this is not to say that her study is without merit. On the contrary, her results suggest that some amount of heating may be tolerated by hemp seed oil. If huge amounts of unsaturated fatty acids were altered in the sample matrix, then the saturated fatty acids (C16:0 and C18:0) would show a substantial relative increase over their native levels. Also, the relative amounts of other fatty acids in the overall profile do not change to a great degree. Unfortunately, however, this study was not quantitative, so it must be assumed that only relative amounts of fatty acids were determined. This means that the methodology only allowed for a measurement of what was seen in the analysis, with no indication for what was not seen. For example, if the chromatographic conditions did not allow for the separation of various combinations of cis-/trans- isomers, we have no indication of isomers containing only one trans- double bond. Should the isomers be separable, standards for these molecules would have to be employed, since the additional signals from their putative formation would otherwise be ignored. Also, if epoxides, peroxides, cyclic compounds or polymers were formed during the process of heating, these products would also have been excluded from the final analysis. Analysis of fatty acids is no easy task, and the absolute quantitation of individual components is seldom the objective. The quantitative analysis of geometric isomers is an analytical realm unto itself, but this is required to confidently verify the conclusions that Dr. Mölleken has made. Such studies have been made on other vegetable oils and on the kinetics of pure components, and this same rigorous methodology must be applied to hemp seed oil before conclusions that are radically different from a large body of previous knowledge can be accepted. Such results would probably show that some small percentage of trans- EFA isomers is formed in hemp seed oil between the temperatures of 170-250°C, in less than 30 minutes. This change would be due exclusively to the physical effects of high temperature on these molecules and therefore is independent of either natural or supplemental anti-oxidant factors. After the percentage of each geometrical isomer is precisely known, the question remains open as to the health risk of these products; i.e. the percentage (if any) of trans-EFA isomers acceptable in a food oil. Analysis of GLA and SDA (Callaway et al. 1998) should be included in such a study because these highly unsaturated hemp oil compounds are likely to sustain isomerization of one or more of their double bonds, and be-cause at least GLA serves as a substrate for delta-6-desaturase. The use of ghee (clarified butter) or another source of a highly saturated oil (e.g., palm, coconut, etc.) may minimize the health hazards of deep frying. However, most natural fats and oils contain at least some percentage of an essential fatty acid. In any case, the relatively low flashpoint/smokepoint of hemp oil renders it impractical to use for this purpose. Until solidly proven otherwise, prudence dictates that hemp seed oil and other highly unsaturated oils are best left unheated, or if heated, then only briefly exposed to temperatures between 100-150 degrees Celsius (212-302 degrees Fahrenheit). Callaway, J. C., T. Tennilä and D. W. Pate 1997. Occurrence of ‘omega-3’ stearidonic acid (cis-6,9,12,15-octadecatetraenoic acid) in hemp (Cannabis sativa L.) seed. Journal of the International Hemp Association 3(2): 61-63. Grandgirard, A., J. L. Sebedio and J. Fleury 1984. 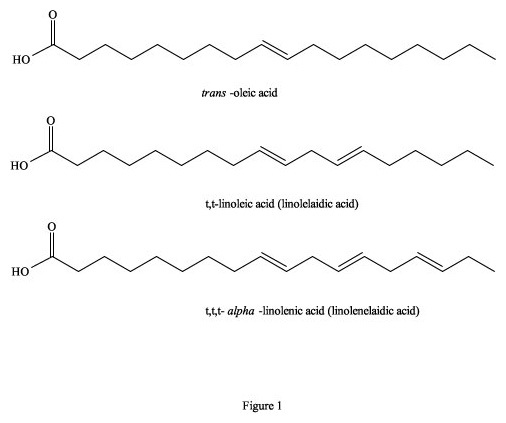 Geometric isomerization of linolenic acid during heat treatment of vegetable oils. Journal of the American Oil Chemists Society 61(10): 1563-1568. Horrobin, D. (Ed.) 1990. Omega-6 Essential Fatty Acids: Pathophysiology and Roles in Clinical Medicine. Alan R. Liss, Inc., New York. ISBN 0-471-56693-4. Koletzko, B. and T. Decsi 1997. Metabolic aspects of trans fatty acids. Clinical Nutrition 16:229-237. Mölleken, H. 1998. Trans-fatty acids in heated hemp seed oil. Journal of the International Hemp Association 5(1): 21-23. Deferne, J-L. and D. W. Pate 1996. Hemp seed oil: a source of valuable essential fatty acids. Journal of the International Hemp Association 3(1): 1, 4-7. Wirtschafter, D. 1997. Personal communication. Wolff, R. L. 1993. Heat-induced geometric isomerization of alpha-linolenic acid: effect of temperature and heating time on the appearance of individual isomers. Journal of the American Oil Chemists Society 70(4): 425-430. Yehuda, S. and D. I Mostofsky (Eds.). 1997. Handbook of Essential Fatty Acid Biology: Biochemistry, Physiology and Behavioral Neurology. Humana Press, Inc., Totow, New Jersey. Callaway, J. C., T. Tennila and D. W. Pate 1994. Occurence of "omega-3" stearadonic acid (cis-6,9,12,15-octadecatetraenoic acid) in hemp (Cannabis sativa L.) seed. JIHA 3(2): 61-63. Inadvertent editorial insertion of trans-fatty acid illustrations was made into Figure 1 on page 62, instead of the proper cis-forms.